You’ve been called in for a screening interview, but you’re not sure what a screening interview is or how to survive one. A screening interview is a type of job interview that’s conducted to determine if the applicant has the qualifications needed to do the job for which the company is hiring. A screening interview is typically the first interview in the hiring process. In most cases, a screening interview includes a brief review of your background and a list of questions designed to determine if you're a viable candidate for the position. The questions will be about your qualifications, but the interviewer may also want to know your salary requirements and availability to work. A screening interview can be conducted over the phone or in-person. In both cases, the results of the screening interview will determine if the candidate moves to the next round of the interview process. What Questions Can You Expect During a Screening Interview? Expect very functional questions during a screening interview. Often, at this stage the interviewer is a recruiter or hiring manager, not the actual manager for this position. The interviewer’s goal is to create a shortlist of appropriate candidates, who will then continue on to the next interview. Interviewers are looking to see if you have the necessary skills for the position and if your salary expectations match the budget allocated for the role. Specific skill-based questions. For example, “Have you worked deploying newsletters?” or “Do you have experience setting up successful store displays?” are skill-based questions. See tips for answering job-specific interview questions. As you prepare for a screening interview, keep in mind that your interviewer is likely speaking with many people for this position. Stand out by making it clear that your qualifications are a great match for the position. Review the job description The job description is a cheat sheet for the company's wants and needs in a candidate. Review the desired qualifications, as well as the main responsibilities involved in the role. While you don't need to do a deep dive, researching the company can help you understand the company's needs and culture better. Make every word count. Screening interviews are often brief, so aim to provide the most important information, rather than being exhaustive in responses. You don't need to recite every task you've performed at previous jobs, just the most relevant ones. That's where reviewing the job description comes in handy, since it provides clues about what to emphasize in your answers. Focus on your skills that match the requirements listed in the job posting. 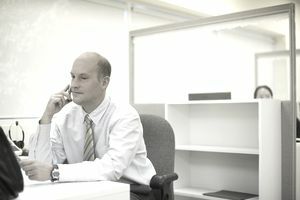 Review phone interview tips. If your interview is on the phone, review telephone interview tips beforehand. Find a quiet place to talk with the interviewer and minimize distractions. It's important to be able to focus on the conversation, not on what's happening around you. The same goes for a video call on a software program such as Skype – find a quiet place and also check the lighting and positioning of your web camera, so you make a good visual first impression. Know your resume. Your resume may have the answers to many of the questions you'll be asked. Be patient if it seems as though your interviewer hasn't read it — he or she may be interviewing many people and can't necessarily remember details about every candidate. Be prepared with succinct descriptions of your previous jobs and stories that prove your abilities. Be straight-forward. Remember, the interviewer is sorting candidates into two piles with screening interviews. You want to wind up in the pile of candidates moving on to the next round. Make it easy by providing exactly the information the interviewer needs, in a straight-forward fashion. Making a personal connection is a bit less important at this stage of the hiring process. Follow up with a thank you note. As with any point of contact between you and a company, you want to acknowledge your appreciation for the time. Use your thank you note to remind the interviewer of your qualifications, and your enthusiasm for the position. Because this is a first round interview and the employer may be making decisions on second interviews quickly, send an email thank you note as soon as possible.